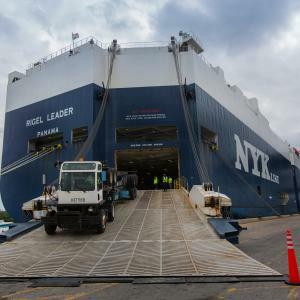 BROWARD COUNTY, FL -- NYK Line today launched its new, monthly "Magellan Straits Express" South America RoRo service from Broward County&apos;s Port Everglades. The first vessel Rigel Leader, loaded at Port Everglades and is destined for the Port of Santos, Brazil. Horizon Terminal Services provides cargo handling at the South Florida seaport. Additional port calls include Argentina, Chile, Peru, Ecuador, Panama Costa Rica, Nicaragua, Honduras, El Salvador, Guatemala and Mexico. Port Everglades is Florida&apos;s leading container port, annually handling more than one million TEUs (20-foot equivalent units, the industry standard measurement for container volumes) and serving as a gateway to Latin America, the Caribbean, Europe and Asia. More information about Broward County&apos;s Port Everglades is available at porteverglades.net or by calling toll-free in the United States 1-800-421-0188 or emailing PortEvergladesCargo@broward.org. Selection of high resolution photos available by calling 954-468-3527.